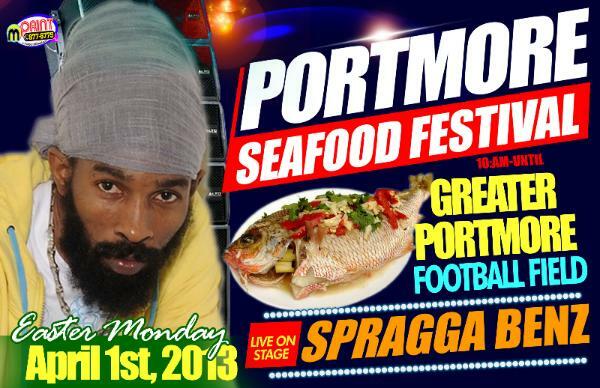 (Shuzzr & Mpr Consulting) - The staging of the 5th annual Portmore Seafood Festival will take place April 1st 2013 at the Portmore Football Field in Portmore St.Catherine, Jamaica. Abuka Entertainment proudly presents a day of unity, food and music for one and all. This years event will feature some of the biggest name in dancehall and reggae music with a range of local and international artists. Grammy award winner Beenie Man, critically acclaimed reggae star Sizzla, and international superstar Spragga Benz have been named as headliner for the festival. 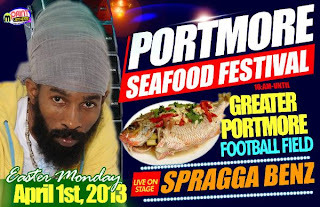 The one day Seafood Festival will give patrons various opportunities to experience the various delicacies and aphrodisiac from the sea, offer all day free rides for children and a high energy performance from artists such as Spragga Benz who hasn’t performed in Jamaica in quite a while. Sizzla and Beenie Man who are crowd favorites will also deliver superb artistry to the delight of their fans, unleashing a slew of hits. Many other artists are set to be announced in the upcoming weeks as part of this star studded dynamic lineup. Abuka Entertainment prides itself in being an intricate part of the community through various projects. Parts of the proceed for the "Seafood Festival" will go to the further development of the Portmore Football Field. The promoters would appreciate your assistance in any and every capacity to accomplish this feat. In keeping with this musical spirit, the promoters have decided to give young talents an opportunity to showcase their voices on the day of the event.